* Travel dates Jun 04-Jul 04. Fares updated on: 4/24/2019 at 1:51 AM. Fares are round trip. Fares incl. all fuel surcharges, our service fees and taxes. Displayed fares are based on historical data, are subject to change and cannot be guaranteed at the time of booking. Paris, the capital of France, is also known as a city of magical lights. It is also renowned world over as the capital of fashion. The city captivates the tourists from world over with its ancient monuments, historical landmarks, works of art, and of course, its amazing boulevards. Paris is a veritable paradise for vacationers. Tourist hot spots like the Eiffel Tower, Notre-Dame, the Orsay Museum and the Louvre Museum endlessly keep the scores of tourists spellbound. This ‘City of Romance’ is simply awe inspiring and a must-visit destination in Europe. Travelers from Los Angeles to Paris have plenty of options available. Three international airports – Orly International Airport (ORY), Beauvais (BVA) and Charles de Gaulle International Airport (CDG) – keep the city well connected with the Los Angeles International Airport (LAX). Major airlines operating flights between Los Angeles and Paris include Air France, United Airlines, US Airways, American Airlines, Continental Airlines, Air Canada, Delta Air Lines, and others. Does your travel itinerary include flights from Los Angeles to Paris? 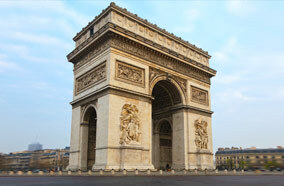 Contact our travel experts at Fare Buzz today for cheap airfares to Paris.